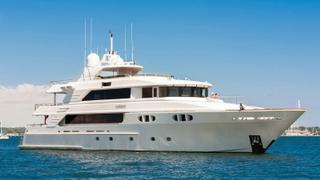 The 43.28 metre Richmond motor yacht Far From It has been listed for sale by Kurt Bosshardt at Denison Yacht Sales. Designed inside and out in as a collaboration between the Setzer and Pavlik design groups, she features a composite hull and is MCA coded with delivery in 2008. Accommodation on this yacht for sale is for 12 guests split across six cabins including a full-beam master suite with his-and-hers bathrooms on the main deck, a VIP cabin on the lounge deck and three queen cabins and one twin on the lower deck, all with en-suite facilities. There are also quarters for eight crew. The elegant main saloon features a seating area with two custom sofas and matching armchairs. A formal dining area with a table for ten is separated from the main saloon by an entertainment centre with 52-inch LCD television, DVD player, music centre and satellite receiver. Forward of the dining room is a galley with a butler’s pantry, island and banquette dining for five. A large sky lounge offers a white ‘pit’ sofa and two matching loungers along with a cocktail bar with four chairs and an entertainment centre with 52-inch LCD television. Moving aft there is a second dining area with seating for ten, a wet bar, 50-inch plasma television and propane grill for al fresco dining. The upper aft deck is also home to the flybridge, which offers a further crescent-shaped bar, a large sun pad, loungers and seating area. The main aft deck also offers seating for meals or cocktails as well as a bar, while the well stocked toy box comes equipped with a 5.7 metre RIB, Jet Ski and dive compressor in the aft dive room. Power is provided by twin 1,800hp Caterpillar C32 diesel engines offering a top speed of 17 knots with a cruising speed of 12 knots. Currently lying in Newport, Rhode Island, Far From It is asking $14.9 million.